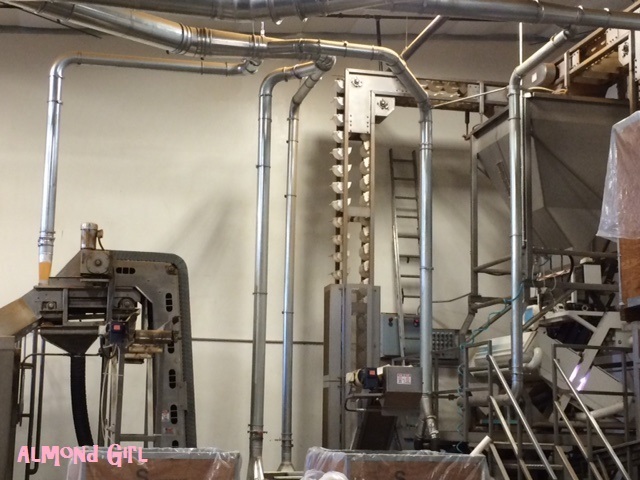 I had the opportunity to tour a local processor in our area to see the next step. 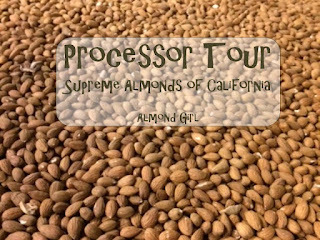 Supreme Almonds of California is a great processor that is right down the street from our farm and they just so happen to send local almonds all over the country and world. They are just one of many local processors that service our great industry. 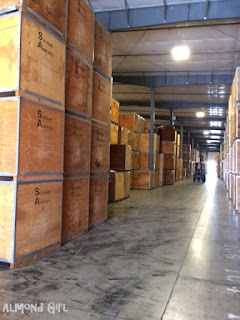 First, Almonds come from the huller in large wooden boxes. 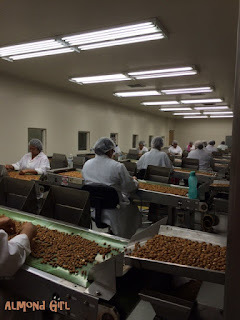 The almonds first get sampled for the processor to keep a small sample of the condition the nuts came in like. They are also sampled at all stages for quality and safety at each step. Then, the almonds go through a series of sizing belts. The sizing belts separate any blemished nuts and then various different sizes are sorted into separate bins. The blemished nuts go to animal feed, or to further processing for almond butter or almond milk. The different sized almonds all have different uses. Small nuts may be used for candy or granola bars while the larger nuts may get used in trail mixes,snack packs or consumed in the natural state. 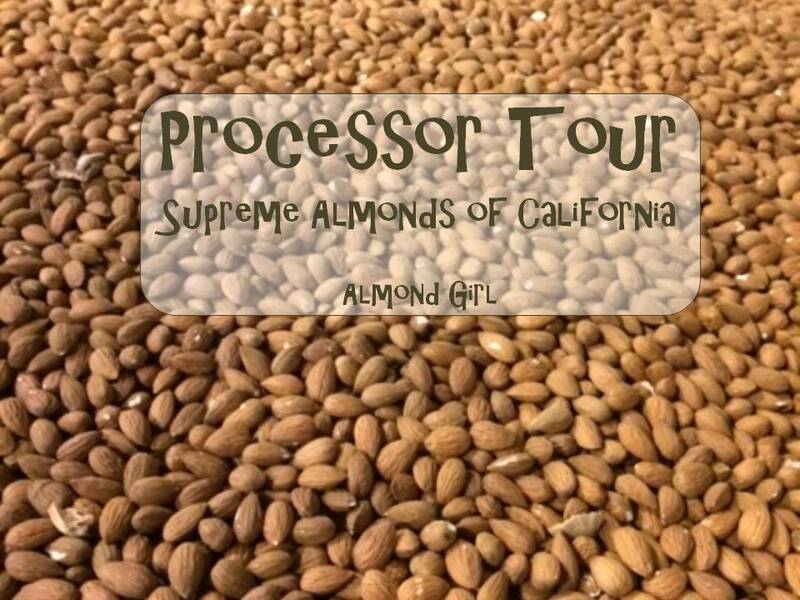 All the different sizes of almonds have so many different uses that each buyer has a preference and desired size they are seeking for their specialty. Once the sizes are separated they are taken to hand sorters. 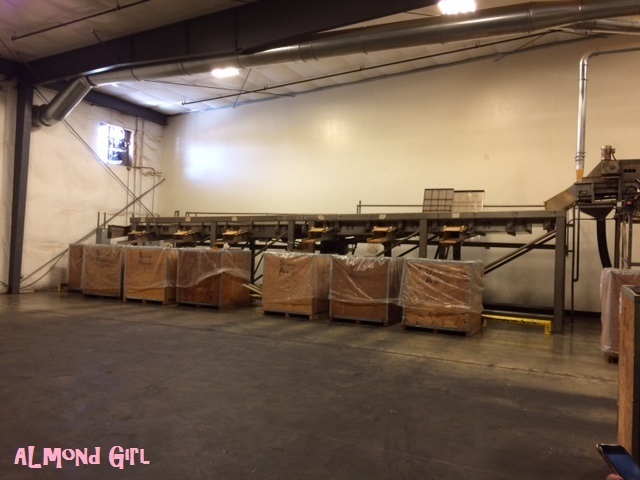 The hand sorters remove any more blemished nuts and any debris that may have been missed. The hand sorted almonds are then run through a metal detector next to ensure any parts from the harvesting equipment or anything non natural is absent. I thought this was a pretty cool step. Especially during hunting season, we get a lot of hunters on our property and it's nice to know anything that isn't supposed to be in the nut is taken out. Almonds are also pasteurized to ensure they are safe for human consumption and free from salmonella or any bacteria. The almonds then get bagged or boxed into the buyers preference and shipped all over the world. The processor was great to see first hand. The care and handling these almonds go through is special. 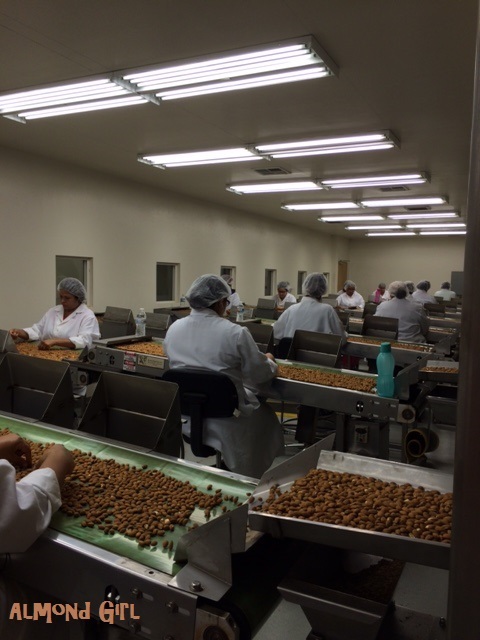 The hand sorters tend so delicately to ensure these are the best almonds being sent out. The almonds truly do look perfect when they get packaged to be shipped out. Almonds are now ready to eat! So go get them while they are fresh!